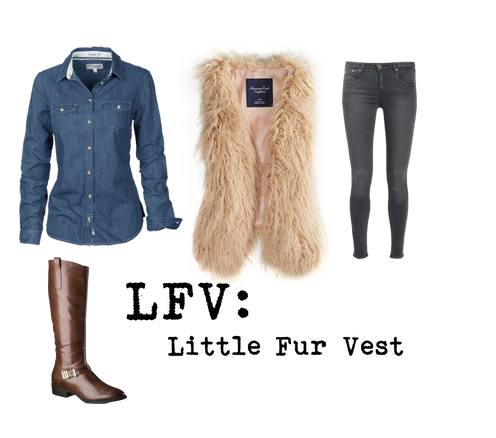 Today i’m loving this perfect little fur vest from American Eagle! It’s under $100 and easy to add to a variety of different outfits. I love that it’s a light color so it doesn’t just blend in with darker hues that are often worn in the fall and winter. Also, boots are a fall essential. I’ve picked out these boots from Target because they are classic AND affordable. They not only go with this ensemble but probably most of your favorite outfits this fall. You likely still have a denim shirt lying around from back when it was a HUGE trend. It’s a classic and fashionable look. If your place of work is casual you can easily pull of this look or just add the vest for Happy Hour after work. That’s what I really love about this look, by putting the vest on or off you can totally adapt to the occasion. Good luck finding your little fur vest for fall!